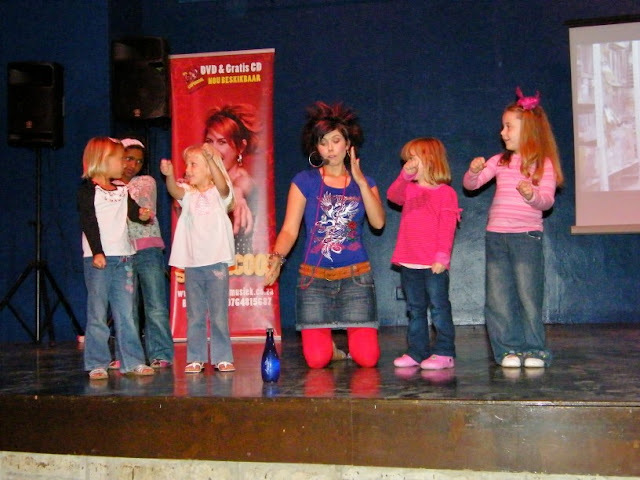 The other night we went to see Nedine Blom do her Supercool kids show at the Boardwalk's Vodacom Amphitheatre. We saw her for the first time when we were on holiday last December and as soon as the Rugrats heard that she was coming to town they wanted to go. And we weren't disappointed. Drama Princess (the blondie in the white top in front of the banner) danced every song and went up onto stage every chance she got. 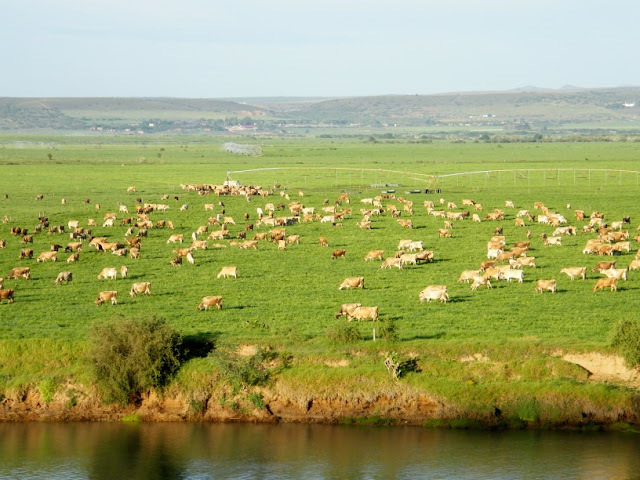 There are big dairy farming areas to both the east and the west of Port Elizabeth producing milk not just for the Port Elizabeth area, but also beyond. Some of these farms are massive, producing thousands of litres of milk every day. Most of the cows on these farms are Jersey and Friesian cows. The ones on this farm in the Gamtoos Valley west of Port Elizabeth are Jersey cows. 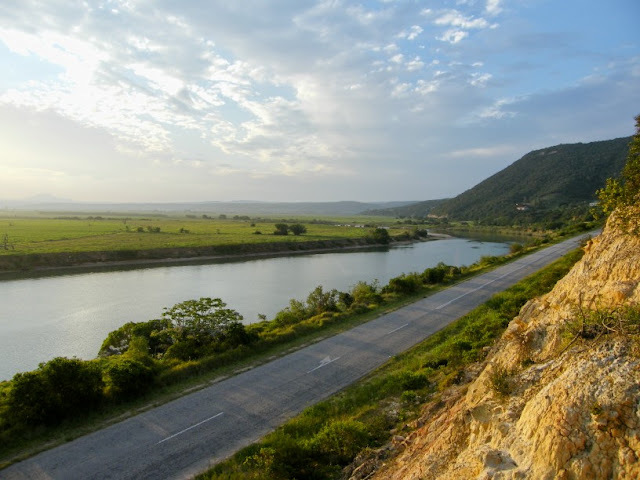 Driving along the N2 one passes over the Swartkops River just before getting to the suburb of Bluewater Bay. 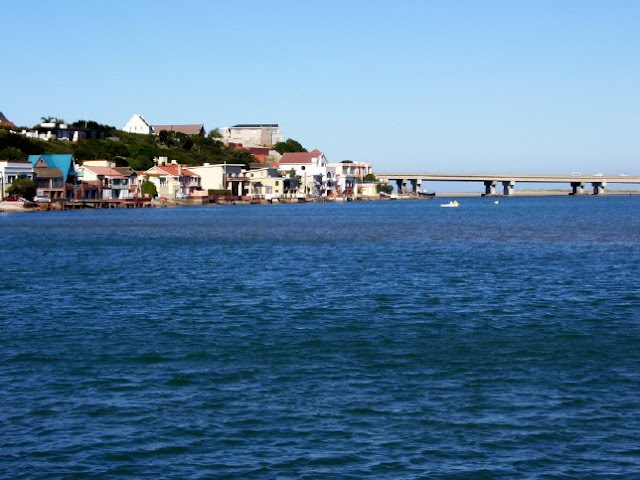 Swartkops is a very popular fishing area with loads of boats out on the river over weekends. The area on the banks of the river is called Amsterdamhoek and was named after a Dutch ship (Amsterdam) that sank off the river mouth in 1817. Its a very upmarket area and is only seperated from the river by a narrow road. 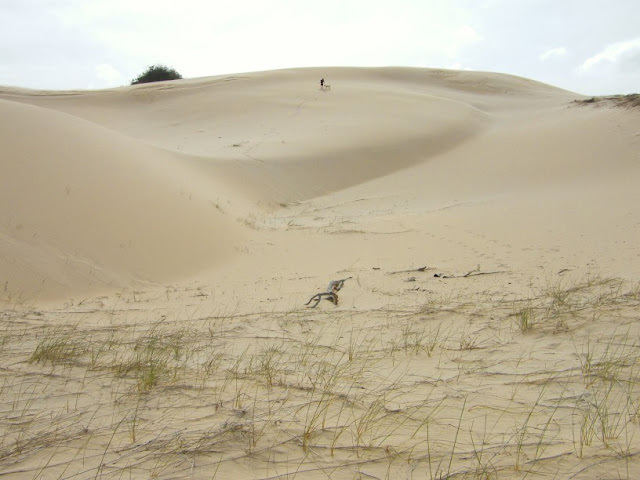 The other day I did a post on the Sacramento Trail leading from Schoenmakerskop to Sardinia Bay. At the start of the trail in Schoenies these steps take you down to the shoreline to the bottom section of the trail. 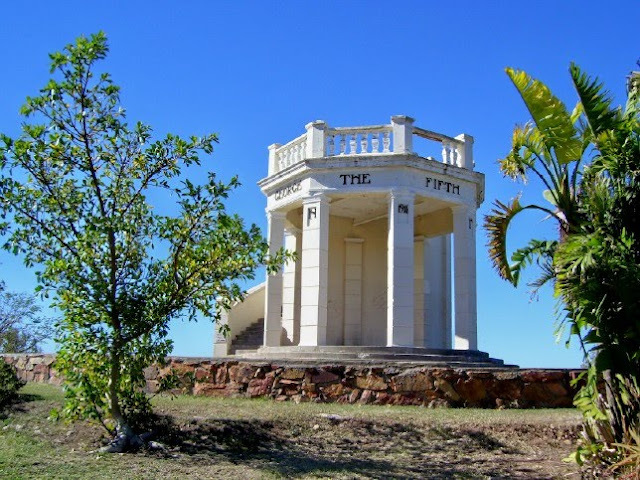 The King George V Memorial can be found on Canon Hill overlooking the town of Uitenhage. It was erected to commemorating the coronation of King George V in 1910. A couple of restored settler houses in Central. I love the bright colours that was used when they got painted. 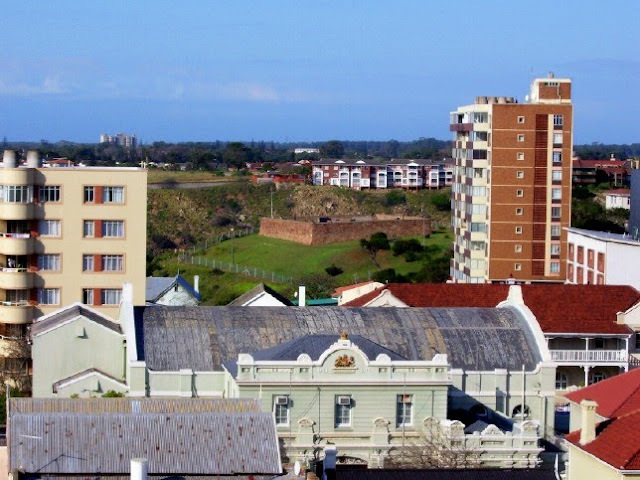 The church in the background is The Hill Presbyterian Church next to the Donkin Reserve. Merry Christmas everybody. 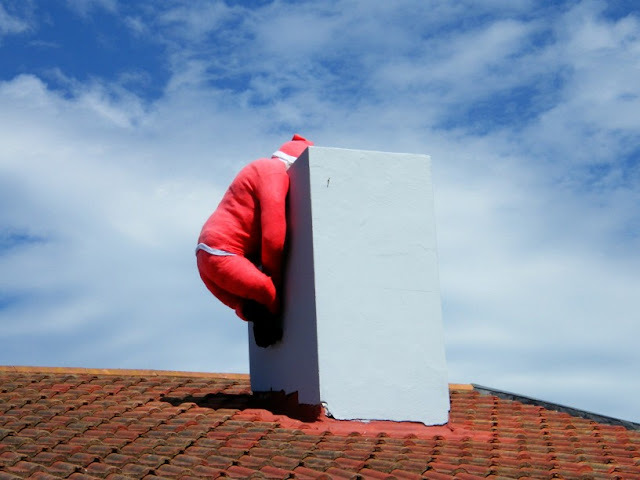 I hope Santa had less problems getting into and down your chimney than he had here on top of Executive Kids in Newton Park. I hope everybody has an awesome day and don't eat too much. 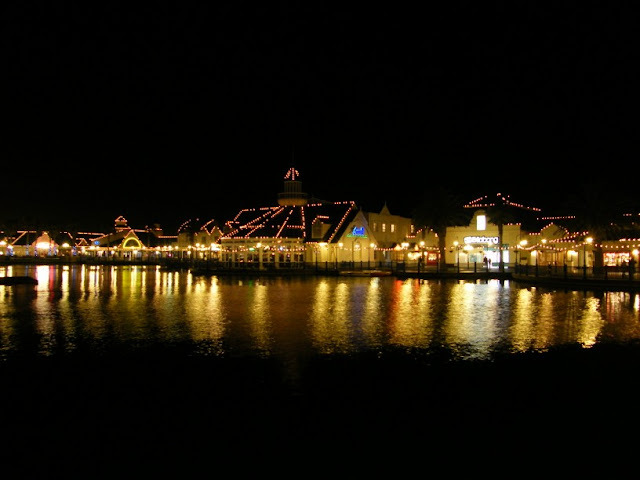 The lights of the Boardwalk Casino and Entertainment Complex reflecting on the Boardwalk lake. 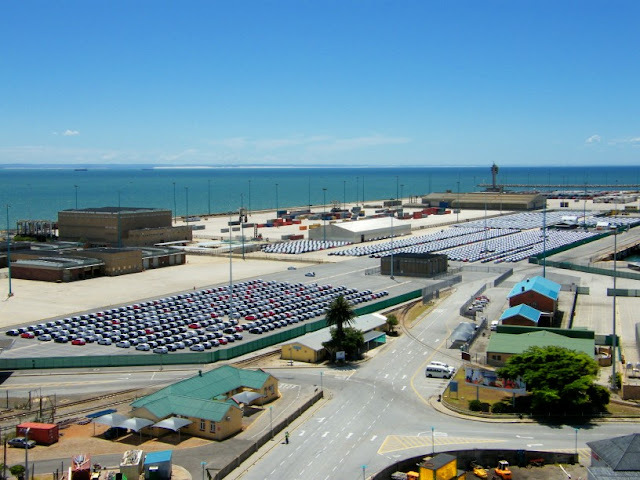 The Boardwalk is very much in the centre of most of Port Elizabeth's summer entertainment with lots of activities going on inside the complex as well as at Hobie Beach across the road. I have posted various view from the top of the Donkin Lighthouse before, but here is one I haven't. Looking south, you can see Fort Frederick in the background between the apartment buildings while the light green building in the foreground is the Prince Alfred Guard Museum. One of the main components at the Red Location Museum in New Brighton are the 12 Memory Boxes. 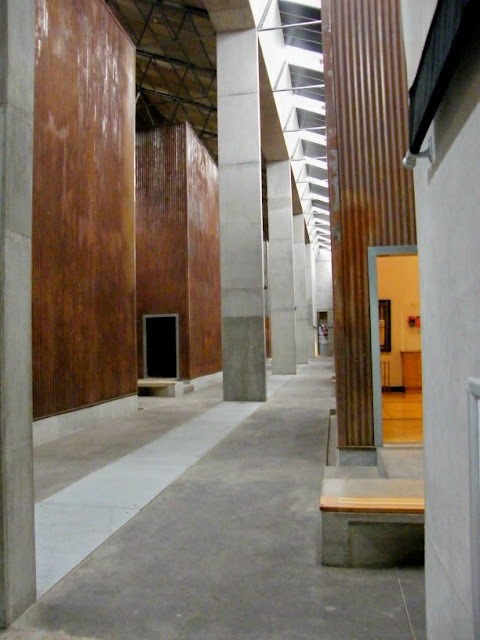 Each of the Memory Boxes consist of a corrugated iron room 6 meters by 6 meters by 12 meters high. Each box has a different exhibit which is only revealed once visitors enter it. Each exhibit is an experience all on its own, and while each can stand on its own, they are all bound together. If you get what I mean. A couple of the old settler houses in one of the older parts of Central. 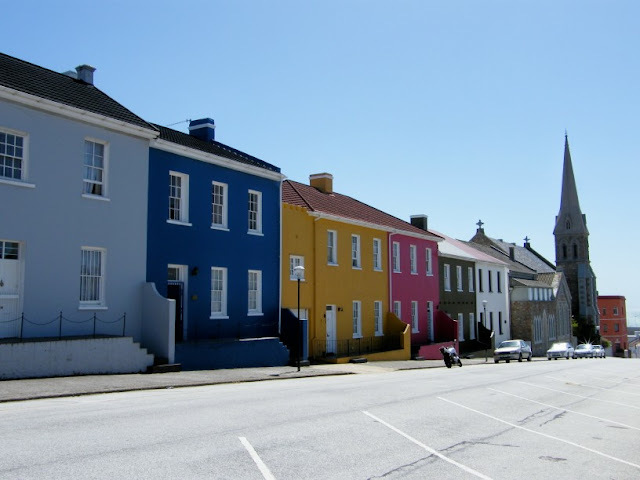 Its amazing how these old houses are exactly as a child would draw a house. Rectangular with a door in the middle, two windows (one on each side) and a chimney on the one side of the roof. 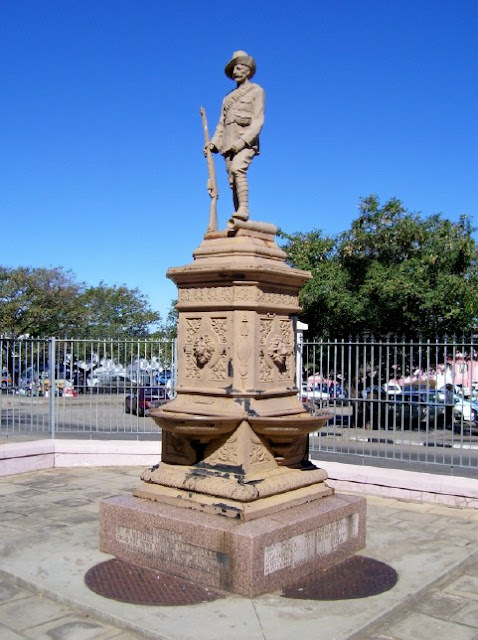 The Anglo Boer War Memorial in Uitenhage can be found in front of the Town Hall and was unveiled in 1904. 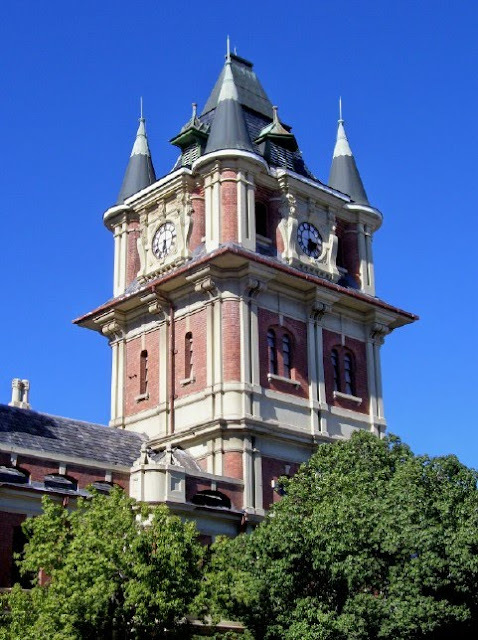 The names of Uitenhage citizens who died in the Anglo-Boer War fought between 1899 and 1902 are inscribed on the base of the monument. It is said that the features of the life-size soldier that makes up the memorial was that of an actual soldier in King William’s Town. I posted a shot of the tug mooring area from a harbour vantage point in August, but got a totally different view from the top of the Campanile the other day which I want to show you. The NSRI guys on their way to their training exercise last weekend. Its amazing how fast that rubber duck was moving even though the sea was a bit on the rough side. Seeing the way the crew was going about their way in the exercise, I would say that one would be in good hands when they come to rescue you in the case of an ocean disaster. 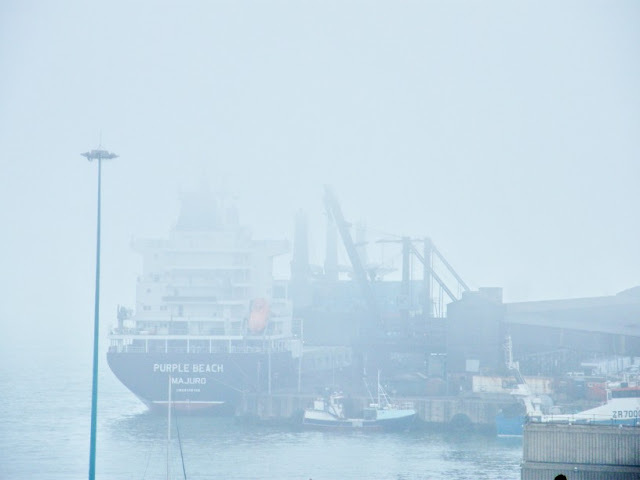 We don't get much fog in Port Elizabeth and if we do it clears up by mid morning at the latest. The other day the coastal part of the city was shrouded in fog for most of the day. I stopped at the Humerail Shopping Centre overlooking the harbour to get a pic of what it looked like. Pity I wasn't on holiday yet as I had lots of photo ideas I would have liked to have tried out. Oh well, next time. 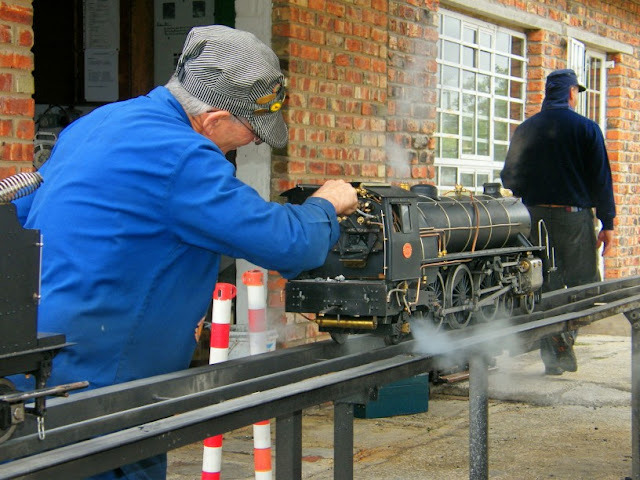 We went to ride the miniature trains at Londt Park last Sunday and it was very interesting to watch afterwards how the guys clean them by taking out the burning coals and blowing the trains clean with a steam gun. Looking east from the top observation area of the Campanile, one looks across the Port Elizabeth Harbor. 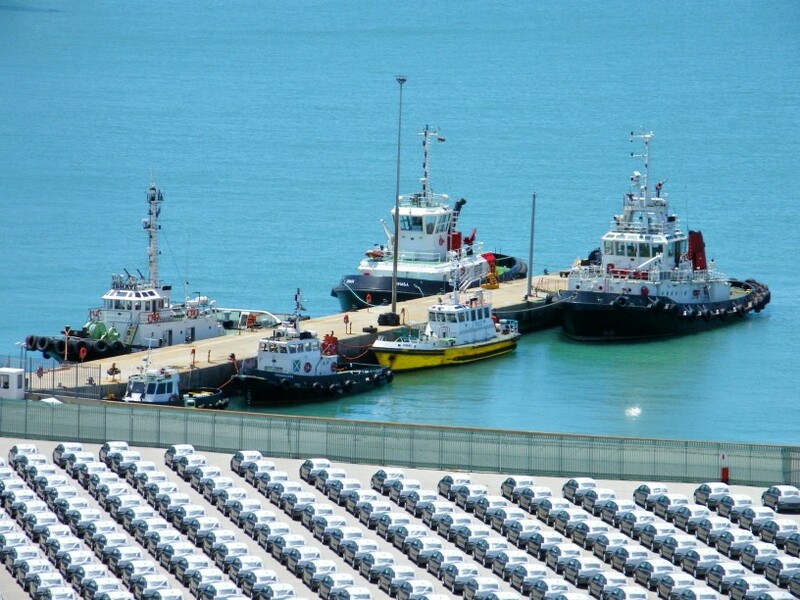 One of the things you immediately notice are the cars waiting for export. With both General Motors and VW have big export contracts, a lot of cars get moved through the harbour which means that there are a number of car ships docking every week. 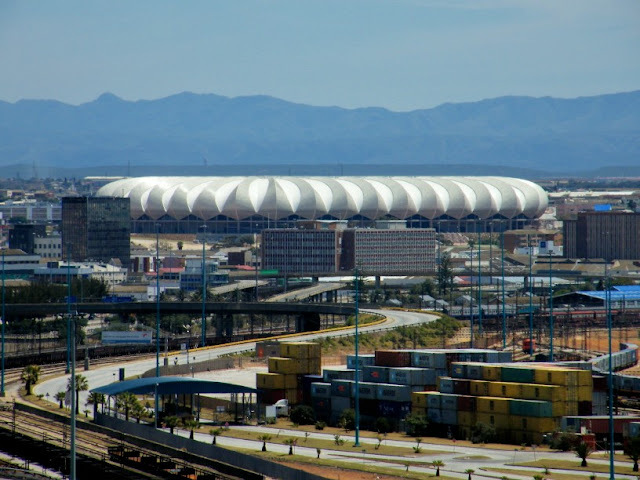 The view of the new Nelson Mandela Bay Stadium from the top of the Campanile. I know this isn't a typical PE Daily Photo, but I wanted to do a post on donating blood. I am a regular blood donor (42 donations so far) and donate blood four to five times a year. A person can donate blood every 56 days and every time you donate they take an unit which is the equivalent of 480 milliliters. 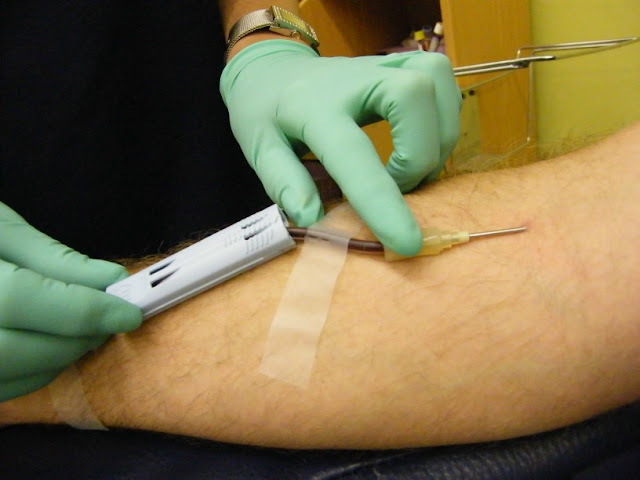 Thousands of people would die daily if there is no sufficient quality blood in stock. If one donates blood, the donor gives patients the gift money cannot buy or science cannot create. A unit of blood donation can equal three gifts of life in that almost every unit of blood is separated into red blood cells, plasma and platelets. This time of year blood donations actually decline as a lot of people go on holiday and may put off donating till they get back to work. Currently there is a shortage of blood with only about two days of stock available in Port Elizabeth. So I would like to urge you to consider becoming a regular blood donor and save a life today. 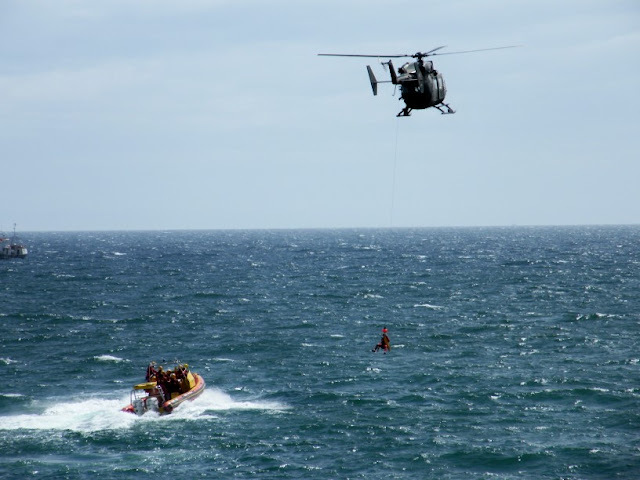 I popped down to the beachfront last weekend to have a look at the guys (and gals) from NSRI Station 6 here in Port Elizabeth doing an airlift rescue exercise. With summer season at hand and more and more boats out there (both commercial as well as recreational), it is important for their guys to be sharp at all times. 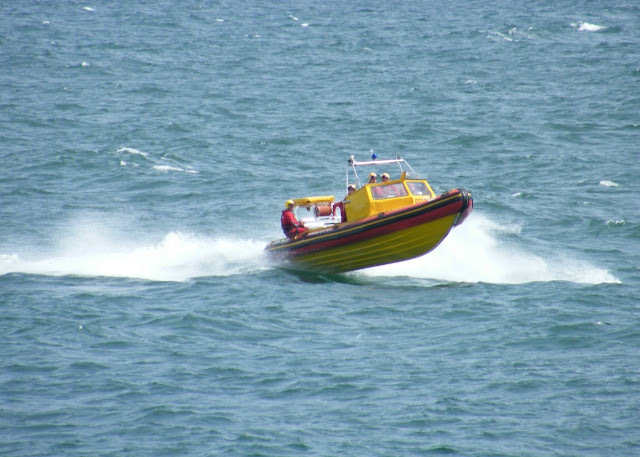 I have the utmost respect for the NSRI crews as all of them do it purely on a volunteer basis which means that they give up valuable time away from their families to risk their lives to save others. Late afternoon next to the Gamtoos River. 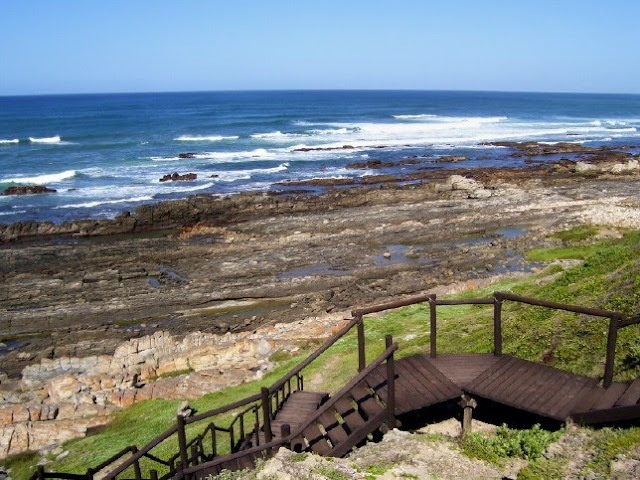 The Gamtoos River can be found west of Port Elizabeth just before you get to Jeffery's Bay. The river flows through the Gamtoos Valley which is one of the main agricultural areas supplying fruit and vegetables to the city. The valley is also where you will find the Kouga Dam, one of the metro's main water supply dams. For more awesome pictures from around the world featuring a bit of sky, visit Skywatch. 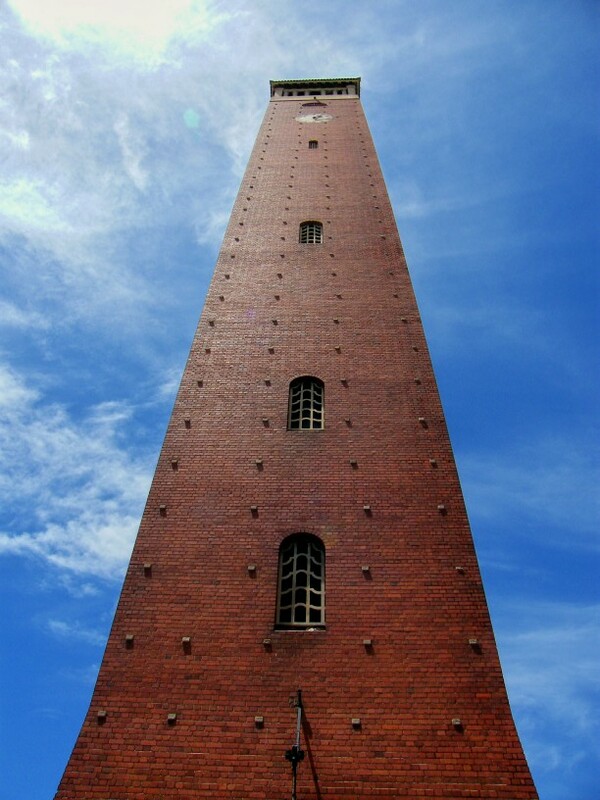 The Campanile was built and completed in 1923 in commemoration of the centenary of the arrival of the British Settlers in 1820. 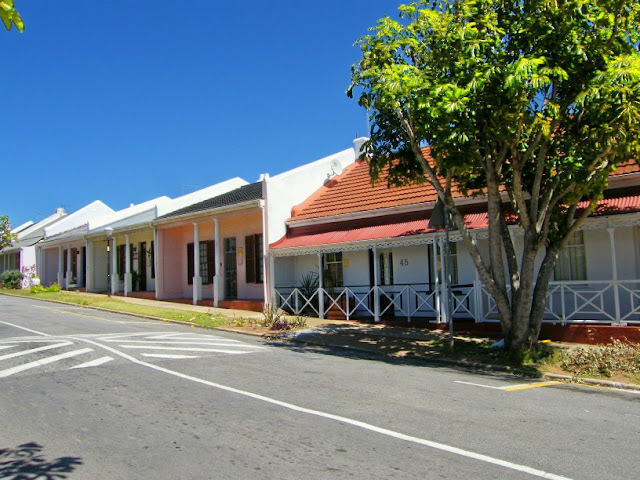 The site on which it stands used to be the landing beach where the settlers were offloaded before their long journey to the Grahamstown district. The tower is 51.8 meters high and has 204 steps to the top. It also has a carillon of 23 bells. The Trinity congregation was founded in 1854 when a group of parishioners broke away from St Mary's Church The original church was built at the bottom of Military Road but a growing need for a church by the people on the Hill saw the church moving to its present site next to Havelock Square. The new church was opened for worship on 1 April 1866. In 1897 a deranged woman set fire to the Church and all but the walls as well as the tower was destroyed. 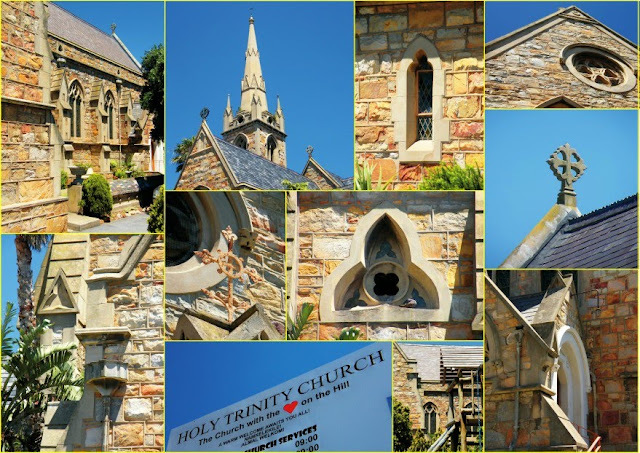 Holy Trinity was only constituted as an Anglican parish in 1930. 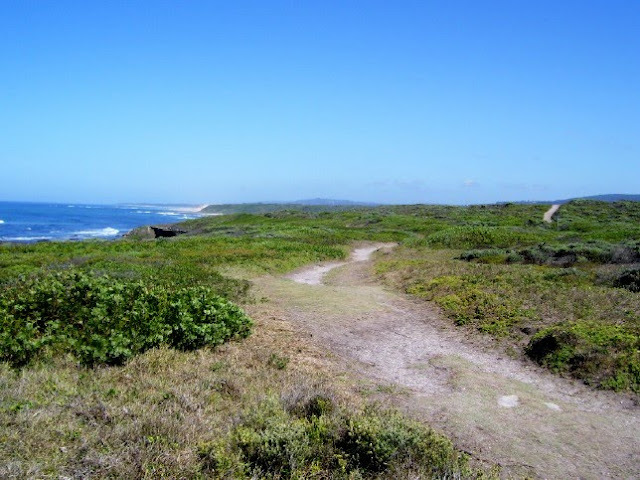 The Sacramento trail follows the coastline between Schoenmakerskop and Sardinia Bay and is about 4km each way. Its been years since I've done the walk and its high time I do it again. Hopefully at some stage during the holidays I will get a chance. Most people take the walk early in the morning and then go for breakfast at one of the little restaurants in Schoenies. 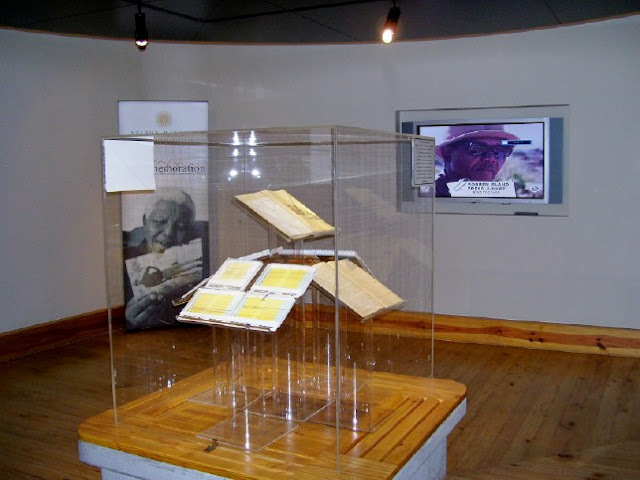 On display in the Red Location Museum are manuscripts from Nelson Mandela's diary from the years he spent on Robben Island. These manuscripts are in his own hand writing and is one of the museums most prized exhibits. 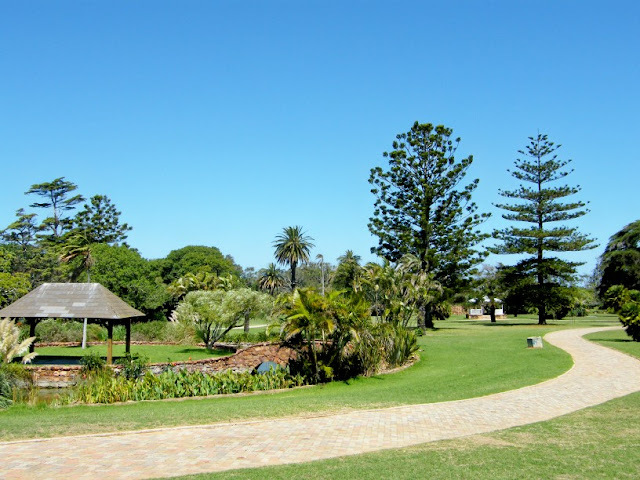 Victoria Park is one of a number of public parks in Port Elizabeth located within residential areas. Situated in the lower section of Walmer close to the airport, Victoria Park has several fish ponds with beautiful waterlilies and big lawn areas. Every year the Eastern Cape Philharmonic Orchestra has a sold out performance in the park which shows that there is a demand for such shows in Port Elizabeth. 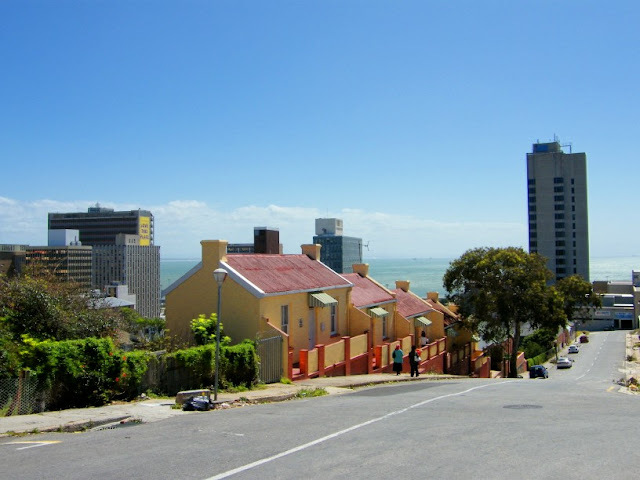 Looking down Upper Hill Street in Central one can see a couple of old historic settler houses dating from the mid 1800's on the left and some of the high rise (high rise in PE terms) buildings in the city centre. The VW AutoPavilion is situated next to the VW factory in Uitenhage and probably is the biggest attraction in the town. 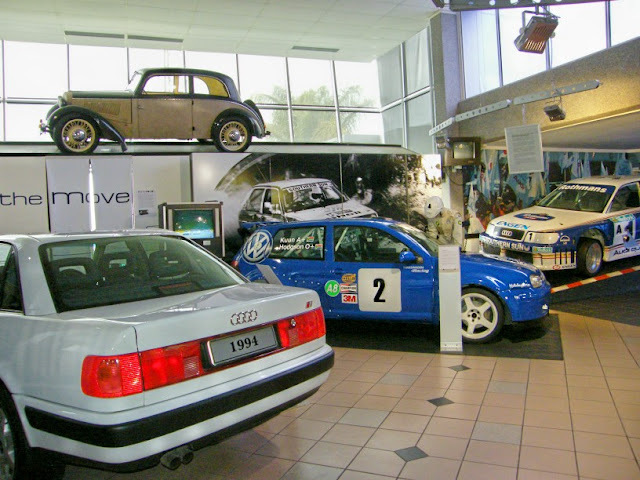 The museum is a high-tech, interactive expo and heritage centre and takes you on a journey through history with the cars that defined the past and inspire the future. I'm not a "car fanatic" like some guys, but I do enjoy visiting the museum every now and then. I haven't taken Chaos Boy yet cause I'm not ensured for museum exhibits, but I'm sure I'll take him there quite soon for him to experience it as well. 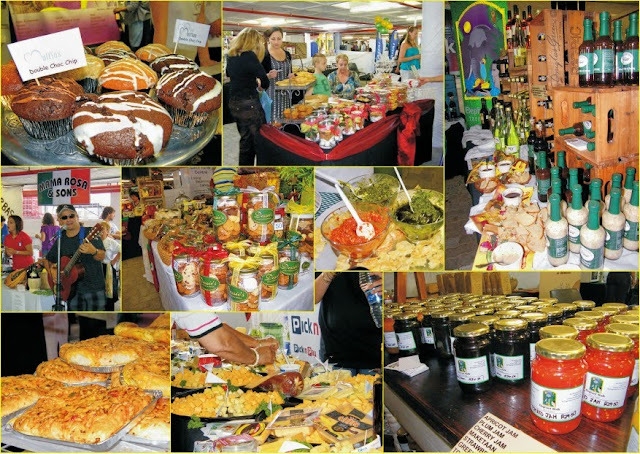 On Sunday the first Walmer Park Food Festival took place at Walmer Park Shopping Centre. The festival will be held on a bi-annual basis with the Summer Festival taking place in November and the Winter Festival in June. The festival included stalls from deli’s, restaurants, entrepreneurs, farmers, manufacturers and suppliers to the food industry as well as cooking presentations and entertainment. At most of the stalls visitors could taste and buy their products. The smell of all the foods were amazing and the taste buds were truly treated to some awesome flavours. I am really looking forward to the next festival as I am sure they would evolve it to be even bigger and better than this one. I think Cooksister would truly have been in her element if she could have visited the festival.